Having a custom site is a great way to show off your professionalism and attract more listings. Shows you go the extra mile to get the property sold. A custom site indicates you are web savvy. Single property sites give that extra special touch to your listing. Real Estate Property Websites in Less than 10 Minutes! 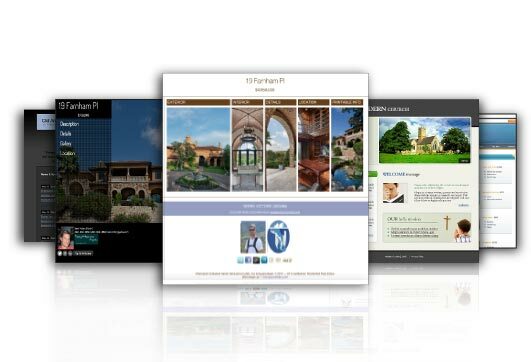 Create fully hosted Real Estate property websites quickly and easily with no coding required. Websites can be created with no coding. You simply drag and drop, select from list and fill out simple forms to create you website. Sites can be created in as little as 8 minutes! All sites come with full hosting FOR LIFE. No need to worry about managing servers or uploading files. Additionally, with full backup support you can sleep easy. Each site starts with a simple template. From there, choose you colors, add your pictures and logo, then add your copy to create a site in just a few minutes. A custom property website is a great way to showcase your listing with more focus than just having a page on your company website. All of our templates focus on high resolution beautiful photo galleries, which is what buyer really want to see when surfing the web. Our sites are not cluttered with useless information that is readily available elsewhere such as restaurants in the area. Most buyers start their search on the web. With a professional looking website, buyers will have more confidence inquiring about the property. Additionally, a professional website attracts future seller customers as well. Creating a website using our software take just a few minutes. Customize the look and feel to your liking or contact us for a completely custom solution. Our Real Estate software is designed with the not-so-technical customer in mind, and we walk you through each step in the creation process. We offer a 100% satisfaction guarantee. You can build your website and test it up before you make it live to see how it looks. If you don't like it, contact us and we will do our best to satisfy you, otherwise you don't have to purchase and activate the listing.